Street art and downtown style. I love downtowns, from our tiny district here in Melbourne to the fabulous, expansive world of Downtown Manhattan. If I had to move anywhere today, I would say, “put me downtown.” The cafes, thrift shops, jazz clubs, vintage book stores, boutiques – I want them all nearby. I think downtown everywhere also has an eclectic dress code – pretty much anything goes. I’ve worn dressy dresses, vintage jeans and everything in between for hanging out. Today it’s a Flamingo sweater (we’re in Florida!) with an a-line cord skirt and suede jacket. Only the sweater is retail, from J. Crew Factory; the jacket and skirt were thrifted . . . downtown. 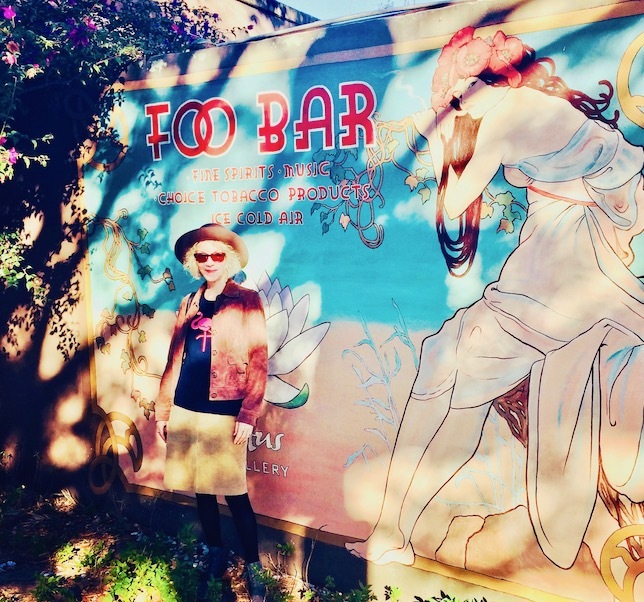 Foo Bar is a fun, hip place to hang out in our small town, with lots of outdoor seating. Great wine and cocktails too. And this repro of an Art Nouveau Alphonse Mucha painting is my favorite part. My Annie Hall hat is c/o Tenth Street Hats, they’re a terrific company. 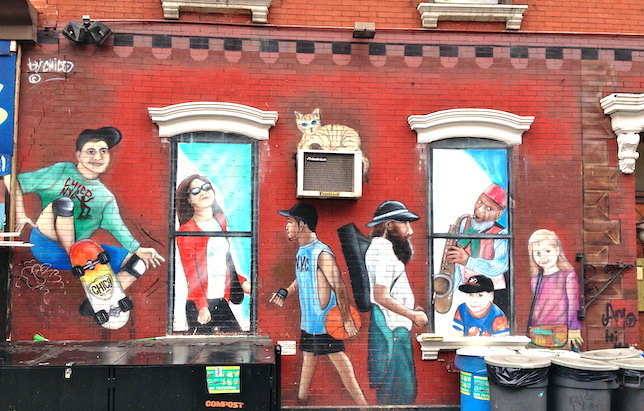 Love this street mural in the East Village NYC, by artist Chico. Did you see the cat? Do you have some awesome places to hang out and feel free? Great street art, perhaps? Show us in the link-up. I always seek out the “downtown” where ever I travel. I’ve found amazing street art in Denver, CO and in Toronto. We have some great mosaic wall art in my neighbourhood here in London Ontario that is excellent for photo backgrounds. Lovely outfit and such fabulous street art! I live in Brighton in the UK and there are areas full of street art. I love them as the people are as colourful as the street art and there’s a saying ‘only in Brighton!’. You say that when you see people who wouldn’t look out of place as extras in Star Wars! And that is exactly why I moved back to Brighton! You look cool and thanks for hosting! Ha! I nearly missed the cat in the mural so thanks for pointing that out. You look all kinds of chic and hip in this eclectic outfit. The hat makes it. I love a fun, creative look! I enjoy visiting a city’s downtown area too with all of the culture and things to do. Charlotte is growing! I haven’t been to Charlotte in ages – would love to meet you there sometime! Your Karina dress is Spring-y and so lovely on you, xox. I love street art! These are fabulous! Oh I love things like “find the hidden statue”. Thanks for linking up with your fabulous self, xox. I agree with you Patti , always enjoy downtown too. You look great amid the street art. Many thanks for hosting , still not sure why I am sideways again, may as well be different. Thanks for the link up. We have a restaurant in town that I’ve been going to since I was in college. It’s a local bar/restaurant type place that strangely enough is kid friendly early in the evening. We’ve been taking the kids there since they were young and it’s everyone’s favorite place. The street art is so beautiful! The mural is so cool and that one in NYC is too – I just love searching for all the amazing murals in a city! Me too! Love your new Jambu sandals, they’re chic and known for their comfort, xox. I wish someone would spray paint Alphonse Mucha on our wall, it’s beautiful! PS It’s Vix! Not sure what happened there! Same here: would love some Mucha on my living room wall! Thanks for coming over, xox. Beautiful backdrop! I like that kind of art. It is not allowed in our city! Oh, that’s too bad! Art on the street makes everything more vibrant. You, on the other hand, are beautifully vibrant in your Spring looks, xox. In the UK we don’t use the downtown expression but we did recently do that in London. It was a great date day. London would indeed make a great date location! Love your playing with accessories today, xox. I love all this fun street-art, Patti, thank you for sharing it. Your flamingo sweater is adorable, as are you. Hug! Whether it’s a true downtown or simply a lively urban district, I also find the energy of human interaction to be exciting and invigorating. Patti, I love the “downtown” backdrops you’ve featured! So fun and so urban–wonderful! I love visiting cities, even though we live in suburbia. But we’re near the coast so I would say the beach and the ocean are my favorite places to hang out and feel free! And currently, I am loving the flowers in our yard–the rain has brought out a gorgeous bloom and that forms the backdrop for most of my photos. Your garden is beautiful, Darlene! Love your styling tips for a denim dress, xox. I love your flamingo sweater. I also agree that many downtown neighborhoods are lively and exciting. Certain parts of the Village are too crowded for me, but I do like the West Village and even Alphabet city. But uptown is quieter and I like that . There are no tall buildings and I get to see the sun. That is my favorite! Have a wonderful week ahead. I adore the West Village, it’s like a step back into graceful history. Thanks for coming by and have a lovely week ahead, xox. Patti, I go downtown almost every week either after my run or on weekends to walk and enjoy some great food . It is just sentimental place for me and I love it. I love downtown and I would spend all my time there <3 thanks for the linkup dear Patti! I loved, LOVED your post today, Lisa, about shopping green. Especially:”Buy Less. Wear and re-wear good clothes.” Excellent advice! Thanks for coming by, xox. I agree! Put me downtown with all the same!! Yeah, come on downtown with me, Becky! Would love to go thrifting with you, xox.